Our Assassin’s Creed Liberation HD walkthrough will guide you through the beginning to ending moments of gameplay with strategy tips for this action-adventure stealth game on the PS3, Xbox 360, PC & PS Vita. Let’s start the Assassin’s Creed Liberation HD walkthrough with an introduction video! Please note that viewers must be at least 18 to watch, so no harm comes to those with innocent eyes. This game includes Blood, Suggestive Themes, Violence. Arriving for the first time as a digital title on Xbox 360, PlayStation 3, and PC, Assassin’s Creed Liberation HD is the striking chapter of the pre-American Revolution Assassin’s Creed saga, featuring unique assassin gameplay mechanics, an immersive Assassin’s Creed storyline delivered in stunning high-definition. The PS Vita chapter of Assassin’s Creed gets a huge HD upgrade with tons of optimizations. Join Aveline de Grandpre in her fight for freedom against the oppressive Templar order. As an Assassin, Aveline soon finds herself on an unforgettable journey that will take her from the crowded streets of New Orleans to voodoo-haunted swamps and ancient Mayan ruins. She will play a pivotal role in the turbulent New Orleans revolution and the beginning of a new nation. As she fights for freedom, not for herself, but for those whose life and hopes have been squashed. — As Aveline, the first playable female Assassin in the Assassin’s Creed saga, you must use your skill, instinct and weaponry – including a machete, poison-dart blowpipe, a whip and duelling pistols – to hunt down and eliminate your enemies. Feast your eyes on a richly detailed world, thanks to the AnvilNext engine which features groundbreaking physics, animation and innovative combat system. Outmaneuver your enemies in the Louisiana bayou with the unique Tree Navigation system, and eliminate them from above with deadly precision. Deep dive under water as you search for lost Mayan treasures, but stay alert; the hostile wilderness and humid swamps are full of menacing animals. Aveline is not the only predator who stalks the hostile wilderness. Taking full advantage of its new hardware, Liberation HD introduces graphical improvements such as high-dynamic-range (HDR) rendering, high definition environments and characters, updated cinematics the sum of which delivers a complete graphic overhaul of the title. The gameplay experience has been revamped too with updated missions that improve the pacing, new missions that dive deeper into Aveline’s story, and updated world design for more gameplay options during mission. Finally, a particular attention was given to the audio with re-mastered music and all-new sound effects (SFX). 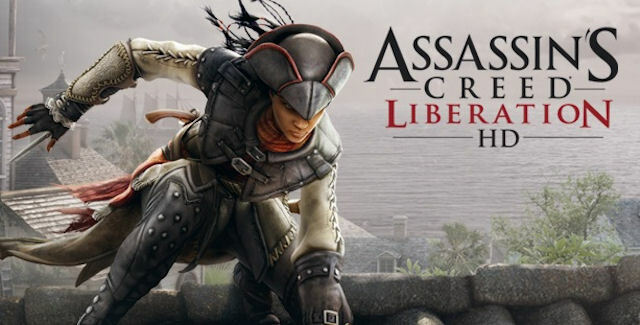 With a unique storyline that sheds light on the nefarious dealings of Abstergo Industries, Liberation HD also introduces Aveline, a new character in the Assassin’s Creed universe at the very heart of the escalating Assassin and Templar conflict in the New World. Find out some Assassin’s Creed: Liberation HD gameplay tips from the creators at Ubisoft themselves in this video interview. Completely remastered and featuring unique gameplay mechanics and an immersive Assassin’s Creed storyline delivered in stunning high definition, Assassin’s Creed Liberation HD is priced at $19.99 / €19.99. Welcome to the Assassin’s Creed Liberation HD walkthrough! Tara will be your guide showing you around the game’s areas. Memory 2 Objective: Go to the pigeon coop. Tip: The instruction manual for this game is conveniently embedded within the game itself. The in-game manual can be found in the “Database”, located in the “Pause menu” while you play the game. It’ll make the user manual quick and easy to get to for the answers you need. Memory 3 Objective: Change into the slave persona. Memory 4 Objective: Tear down the poster. Memory 6 Objective: Find the cargo while the men talk. Assassin’s Creed Liberation HD Walkthrough continues on Page 2 with Memory 7: The Key to the Problem.